Tambourine Studio, Highland Park, CA. Steve Forman Percussion. Tambourine Studio is a multi-tasking production facility in Highland Park, California, between Pasadena and the heart of Los Angeles. Today the studio serves two main creative functions: It’s the music production studio of composer- percussionist Steve Forman, where new music for live concerts, dance performances, TV and film scores, and interactive media is created. 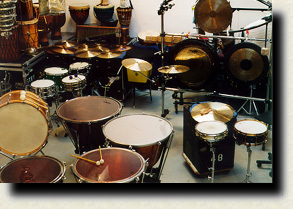 Tambourine Studio retains a substantial resident collection of percussion instruments and sound effects on site, with access to Steve Forman’s vast array of “rolling” recording percussion gear maintained and moved by Royal Cartage in Sun Valley CA. Royal provides cartage and instrument rental services to the many of the finest studio recording percussionists in America. 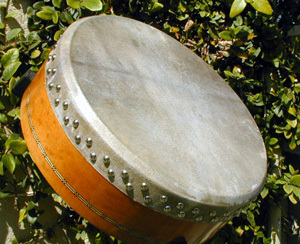 Tambourine Studio also houses the instrument workshop where Steve Forman produces Tambourine Studio Bodhráns, the choice of serious Irish Traditional musicians who play the finest contemporary tunable bodhráns available today.